Buy Bio D Multi Surface Sanitiser Spray 500ml in the UK from our online shop or directly from our independent Scottish store. A wonderfully effective non-scrach eco friendly sanitiser for most surfaces. For small areas, use undiluted, for larger areas, add a small amount to water for maximum effect. Where can you buy real Multi Surface Sanitiser Spray safely online? If you are wondering where you can buy Bio D Multi Surface Sanitiser Spray 500ml safely online in the UK, then shop with us. 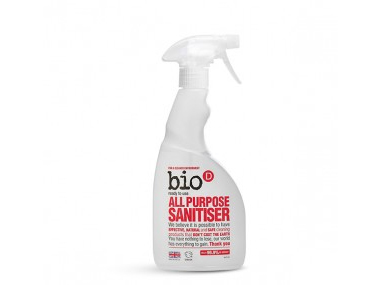 Multi Surface Sanitiser Spray - Bio D Multi Surface Sanitiser Spray 500ml in Cleaning & Laundry and Household.